Between germ-infested airplanes, tempting poolside cocktails, and the stress of navigating an unfamiliar place, staying healthy on the road can be a struggle for any globetrotter. But there are a few simple steps you can take to stay healthy when you travel. Here’s how to maintain your healthy habits on your next adventure — so you can do more exploring and less coughing. No one wants to spend their hard-earned vacay days recuperating in a hotel room. Take these steps to stay germ-free on your next trip. Shanon Sidell, ND, L.Ac., suggests creating a “prevention kit” that includes vitamins and supplements — like vitamin C or odorless garlic tablets — that can help support your immune system (which will likely be working overtime, especially during flu season). If you’re traveling to a warmer climate, you may also want to include bug repellant with DEET in your kit to help prevent mosquito-borne illnesses. 2. Steer clear of germs when flying. We’re all pretty vigilant about germs in airport bathrooms, but Sidell cautions that other sneaky surfaces are also teeming with germs — like water fountain buttons, TSA bins, tray tables, arm rests, air vents, windows, and window shades. She recommends packing antimicrobial cleaning cloths to wipe down those areas before settling in, and using the sanitized, plastic-wrapped airplane blanket to cover your seat. Nothing can throw a wrench in your travel plans like a bout of food poisoning. Drink bottled water — and skip the ice cubes! — when you’re traveling to developing countries. Avoid ordering raw foods if you’re unsure about the restaurant. (That includes lettuce in salads!) And if you want to eat fruits and vegetables, stick to those that have a peel, and rinse them with bottled water first. Opt for cooked foods and dry, packaged items whenever possible. 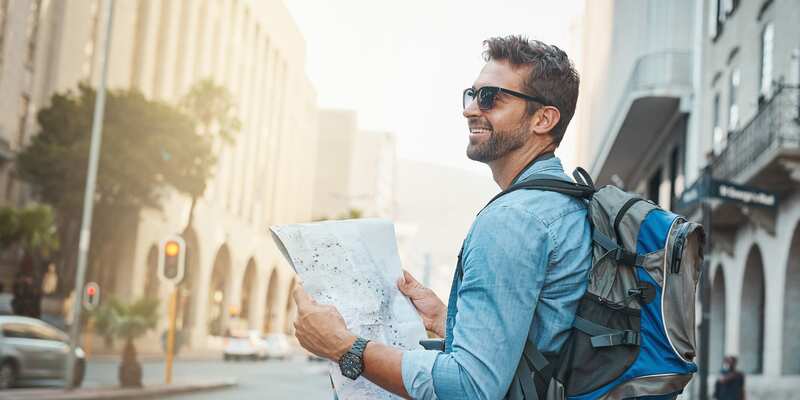 There’s something to be said for lounging in a hammock all day, but these tips can help you keep your fitness goals on track while you travel. 1. Pack portable fitness equipment. If your hotel doesn’t have a gym, or you’re staying at an AirBnb, bring some travel-friendly fitness equipment that doesn’t take up a lot of space — like resistance bands and a jump rope — or stream online workout videos on your phone when you’re on the hotel WiFi. 2. Get a weekly pass. If you plan on staying in the same destination for a bit, many yoga studios and gyms offer day passes, weekly trials, or Groupon deals. Local gyms “can be a great place to meet people from the area,” says Sidell, which is a definitely an added bonus — so no excuses! 3. Burn calories while sightseeing. Most cities offer a free or inexpensive walking tour, which is a great way to immerse yourself in your surroundings and get in those steps. Sidell also advises taking advantage of local activities. Staying in a snowy winter wonderland? Try cross country skiing. Relaxing in a tropical paradise? Rent a kayak or take a surfing lesson. Travel can be stressful, and stress can mess with your immune system. Here’s how to take some of the stress out of traveling (because vacations are supposed to be relaxing, right?). You really don’t need four pairs of jeans for a weekend getaway. Sidell suggests packing as minimally as possible — less stuff to think about and less weight to lug around the airport. Only pack the essentials, and leave valuables at home so you don’t have to worry about getting your prized possessions stolen. Lack of sleep can impact your immune system, so resist the urge to stay out all night partying. And to combat jet lag when traveling long distances, Sidell suggests arriving “in the late afternoon, so you get a couple of hours of sunlight before sunset.” Then head to bed anytime after 7 pm. Whether you’re grabbing fast food at the airport or indulging in all-inclusive desserts, it’s easy to rack up calories while you’re away. Here’s how to avoid wreaking havoc on your healthy eating habits. 1. Watch your alcohol consumption. A few drinks when you’re in vacation mode is normal, but try not to go overboard. “If you don’t down Mai Tais for breakfast at home, no need to start now,” Sidell says. Not only are those fancy cocktails loaded with extra calories, but too much alcohol can weaken your immune system, putting you at risk for other travel-related illnesses. 2. Find accommodations with a kitchen. Staying in a villa or vacation rental with a kitchen can not only help you make healthier choices, it gives you an excuse to shop at local markets, which is a great way to experience the culture. Look, eating healthy is important no matter where you are — but give yourself permission to indulge a little. Food is practically synonymous with culture, and you don’t want to regret missing out on the local cuisine. A good rule of thumb is to try to fill up on veggies and lean proteins as much as possible, and then save a little room for any indulgent treats. Or pick just one or two meals to go all out. (The occasional cheat meal is fine — really.) Travel is an adventure, so have fun with it!